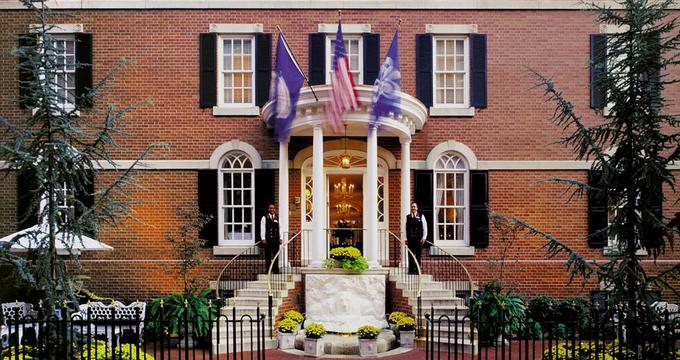 Kimpton Morrison House is a gracious and sophisticated Federal-style hotel located in the heart of the historic Old Town Alexandria. The beautifully appointed upscale hotel features charming Colonial-style décor, refined accommodations, first-class dining, facilities and amenities, and an array of cultural and outdoor activities to enjoy. Situated just steps from bustling King Street, the boutique hotel is renowned for its award-winning service, whimsical, a literary-inspired design featuring original artwork and tinkling botanical and water elements and luxurious accommodations. 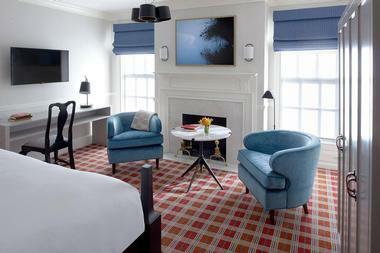 Established more than 30 years ago, the Kimpton Morrison House presents classic Old Town Alexandria with a contemporary touch by combining gracious style with modern charm. Grand granite stairways and inviting parlors retain and Old World charm while beautifully appointed accommodations to feature luxurious furnishings and state-of-the-art amenities. Complimentary refreshments are served throughout the day and evenings offer free wine tastings and appetizers for guests to enjoy. An onsite restaurant and bar serve outstanding cuisine and drinks in an elegant and relaxed setting. Situated in the heart of Alexandria’s Old Town, Kimpton Morrison House is ideally placed for a quiet weekend getaway or an attraction and activity-packed break. 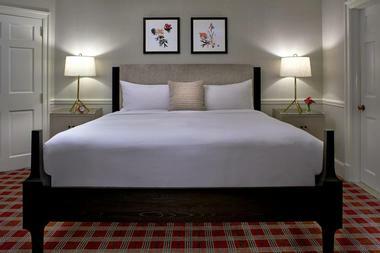 Located just eight miles from downtown Washington, D.C., the hotel is within walking distance of the National Harbor, the Torpedo Factory Art Center, and the King Street Metro Station, and is a 15-minute drive to George Washington’s Mount Vernon Estate. 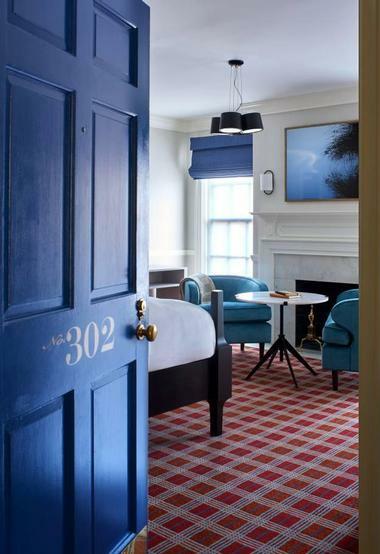 Kimpton Morrison House features 45 beautifully renovated guest rooms and suites that offer a bold and contemporary take on Federalist classic design with bold geometric patterns and bright hues. Rooms are flooded with natural light through vast floor-to-ceiling windows while comfortable furnishings and gorgeous drapery add a classic touch. Modern amenities are featured in every room and suite and include luxurious bed linens, deluxe bath products, flat screen televisions, in-room coffeemakers and mini fridges, and oversized workspaces with desks. Deluxe Queen Rooms feature queen-sized beds in luxurious imported linens, and private en-suite bathrooms with Italian marble baths, and Atelier Bloem bath products. Spacious sitting areas have queen-size pullout sleeper sofas and comfortable lounge seating, and modern amenities such as flat screen televisions, in-room coffeemakers, and mini fridges. Queen Studios feature queen-sized beds in luxurious imported linens, and private en-suite bathrooms with large, glass-enclosed showers, and luxe Atelier Bloem bath products. Comfortable lounge seating and queen-size pullout sleeper sofas are set in the living areas, which have modern amenities such as flat screen televisions, in-room coffeemakers, and mini fridges. Lower level Queen Studios have beautiful hardwood floors and glass-enclosed showers. Deluxe King Suites feature king-size beds in luxurious imported linens, and private en-suite bathrooms with Italian marble baths, and premium Atelier Bloem bath products. Modern amenities such as flat screen televisions, in-room coffeemakers, and mini fridges abound in the separate sitting areas, which also have comfortable lounge seating, coffee tables, decorative fireplaces, and oversized workspaces with desks. King Studios feature king-size beds in luxurious imported linens, and private en-suite bathrooms with Italian marble baths, and premium Atelier Bloem bath products. Comfortable lounge seating and queen-size pullout sleeper sofas are set in the living areas, which have modern amenities such as flat screen televisions, in-room coffeemakers, and mini fridges. Lower level King Studios have beautiful hardwood floors and glass-enclosed showers. King Premier Rooms feature king-size beds in luxurious imported linens, and private en-suite bathrooms with Italian marble baths, and luxe Atelier Bloem bath products. Modern amenities such as flat screen televisions, in-room coffeemakers, and mini fridges abound in the separate sitting areas, which also have comfortable lounge seating, coffee tables, decorative fireplaces, and oversized workspaces with desks. Deluxe Suites are 338 square feet in size and feature separate bedrooms and sitting areas. Bedrooms offer king-size beds in luxurious imported linens, and private en-suite bathrooms with Italian marble baths, and expensive Atelier Bloem bath products. Separate sitting areas have comfortable lounge seating, coffee tables, decorative fireplaces, oversized workspaces with desks, and modern amenities such as flat screen televisions, in-room coffeemakers, and mini fridges. 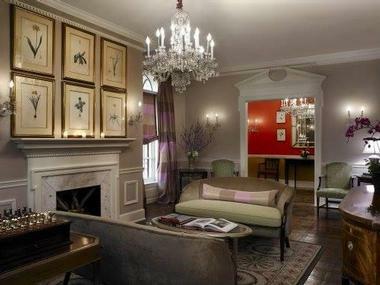 Kimpton Morrison House’s on-site restaurant and bar, Ashlar, offers upscale American dining with an Old World elegance. This stylish bistro and cocktail bar is a warm neighborhood retreat with a cozy 32-seat dining room and modern 18-seat bar both furnished with Federal style décor. Serving classic Southern cuisine with an elevated twist, Ashlar’s Executive Chef Bobby Surdam presents a farm-to-table-meets-fine-dining approach, with creative menus that feature local delights such as Rappahannock River oysters and juicy steaks. Other delights on the rustic menu include crab fritters with Old Bay aioli, freshly caught bass and shellfish in a rich, smoked tomato broth, and succulent pork cheeks braised with local Port City beer and served with pickled mushrooms. The innovative cuisine is paired with an extensive beverage program draws inspiration from Alexandria’s founding in 1749 with spirits such as Madeira, rum, and sherry, along with an array of local Virginia whiskey, beer, and wines from around the world. Ashlar Restaurant and Bar can also be used for private dining and special events, as well as 24-hour room service to all guest rooms. Amenities and facilities at the boutique Kimpton Morrison House range from concierge and business services, pet- and eco-friendly offerings, and in-room yoga mats and spa services, to a daily hosted wine hour and nightcap program. Guests have access to electrical car charging stations for Tesla and other universal electric vehicles, and a 24-hour business center provides computer access to high-speed Internet, as well as printing, fax and copying services. Complimentary coffee and tea are served every morning and an evening Nightcap Program presents a small glass of spirits, paired with a sweet treat for each guest. Additional guest services include valet parking, overnight laundry and dry cleaning service, and 24-hour concierge services. Antioxidant Vitamin C Facials. Gentlemen's facials and hand and foot treatments are also available. Kimpton Morrison House features a variety of elegant and inviting event and function spaces, catering for a range of events, from weddings and baby showers to corporate retreats and business dinners. The beautiful Federal style building offers approximately 2,000 square feet of meeting and event space that can be configured into a range of smaller rooms for all types and sizes of functions. Thes include a cozy central gathering parlor near the fireplace and a classy bar to a brand-new boardroom, and the magnificent new Watermark Ballroom that can seat up to 80 guests. 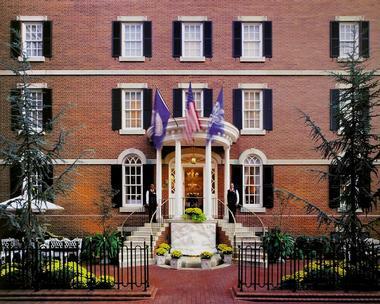 Inviting meeting rooms are complemented by high-end service in a refined colonial atmosphere. 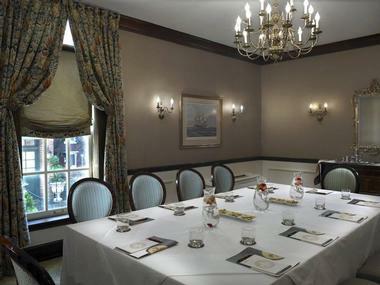 Kimpton Morrison House boasts more than 2,000 square feet of meeting space for up to 80 delegates and guests and meeting packages include decor and catering services, audiovisual requirements and equipment, luxurious accommodations, fine dining and additional activities and guest services. Unique event spaces for weddings, gatherings, and other social functions are spread over 2,000 square feet and exude their own contemporary style and flair. Catering for up to 80 guests, party venues can be configured for standing or banquet-style events and decorated accordingly by professional event planning teams. Additional event planning services include personalized catering and menus, events planning and details, luxurious accommodations, fine dining and other activities and guest services. Nestled on the banks of the Potomac River, the beautifully preserved historic district of Old Town Alexandria is home to vibrant art galleries, world-renowned museums, iconic memorials and monuments, award-winning restaurants and bars, boutique stores and shops and an array of other attractions and activities to enjoy. The historic cobblestone streets of Old Town bustle by day with shoppers, art enthusiasts, and museum goers, and by night come alive with buzzing bars and bustling restaurants that line the streets. The waterfront hosts annual festivals and various events throughout the year while water taxis shuttle passengers across the Potomac River to the National Harbor and Georgetown waterfront. Nearby attractions and must-sees include the King Street's Market Square and City Hall, Gadsby's Tavern Museum, the Torpedo Factory Art Center and the George Washington Masonic National Memorial – all of which can easily be reached by hopping on the King Street Trolley, which shuttles along Old Town’s main street. Back to: Weekend Getaways from Washington, DC and Best Things to Do in Alexandria.